Nubra valley,popularly known as the valley of flowers,is located at the karakoram pass at an elevation of 10,000 above sea level. 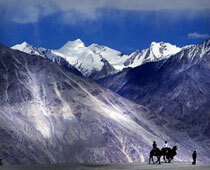 Khardung-la pass, the highest motorable road in the world, is gateway to Nubra. 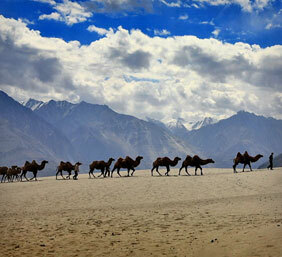 The valley is the confluence point of two rivers namely Nubra river and Shyok river.Travelers pass through some of the most scenic locations in the region en route Nubra Valley. Nature lovers should not miss the lifetime oppurtunity of exploring this land. Travelers are required to obtain an Inner Line Permit from Leh which can be easily obtained from the office in Leh.There are many small villages that are located along the valley. Deskit is the administrative centre of Nubra.Deskit Gompa ia an old monastery lacated on the highest crest of the town. The monastery is as old as 350 years and houses a maitreya Buddha statue. It is a home to over hundred monks.The architecture of the monastery reflects Tibetan style and culture. Panamic is an astonishing piece of nature work.It is a famous picnic spot.It has an outstanding hot water natural spring of medicinal qualities.It is the final frontier of India towards Tibet. Samstalling is a famous and beautiful town. It lies between Kyagor and Sumur village.It's monastery is famous for its collection of Buddha idols,frescos and Buddhist scrolls. the monastery encompasses seven temples. Ensa features an amazing 250 years old monastery perched on top of a rock that overloooks the snow-capped mountains of Nubra valley. it is a six hour trek to reach Gompa via Panamik.At night the sky provides an amazing view, it is studded with stars that seem oversized(due to the altitude) and the shooting stars seem to fall slower than usual,leaving behind a long shimmering trail.You will also come across small waterfalls. Hunder is an example of sheer beauty.Hunder Gompa has old frescoes and a statue of Buddha.It is the best place in the village for viewing dippind sun.